Global factory activity continued to improve in May amid growing optimism that the worst of the recession may be over. Output contracted at a much less ferociously than at the start of the year in one economy after another, and this month three countries registered growth in output - India, China and Turkey. 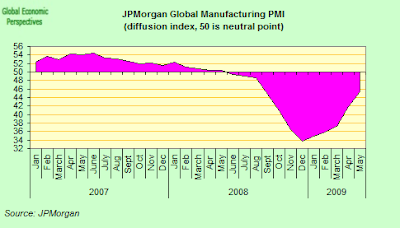 The JP Morgan global manufacturing index (PMI) rose to 45.3 in May from 41.8 in April, the highest level in nine months, although still a long way below the 50.0 mark dividing growth from contraction. The component indexes for output and new orders were both running at much higher levels than in April. However, the headline PMI is still at a very low level by historic standards, and well below one which would be consistent with outright recovery. However, it is clear that the easing of the worldwide manufacturing recession signaled during the past two months has been substantial. The month-on-month gains in the PMI, output and new orders indexes in April and May are the greatest in the series history (which is not that surprising follow a series of record falls). All of the national indexes for these variables rose during the latest survey period. Among the countries surveyed (see foot of post for details) only India, China and Turkey reported increased production. Japan (slowest for 13 months), the United States (weakest fall in current nine-month downturn) and the United Kingdom (slowest drop in a year) saw substantial easings in their respective rates of contraction. Although the Eurozone vastly underperformed relative to the global average, its output index rose to the greatest extent in survey history and to an eight-month high. New orders contracted for the 14th month running in May, the longest period of contraction in the survey history. However, the Global Manufacturing New Orders Index climbed to 48.6, its highest level in a year. The rate of decline in global trade slowed sharply to its weakest since last September. China and India reported increases in total new orders for the second successive months in May. The U.S. and Turkey were the only other nations covered by the global survey to report gains, with new business rising for the first time in one-and-a-half years in the U.S. and for 17 months in Turkey. Although May data pointed to substantial jobs losses, the rate of decline eased to a six-month low. Employment has now fallen for 14 successive months. Almost all of the nations covered reported lower staffing levels, the exceptions being India (slight gain) and China (no change). Among the other countries, only the U.S. and Austria failed to report slower rates of decline. The pace of job cutting eased to five, six and seven-month lows in the Eurozone, Japan and the U.K., respectively. 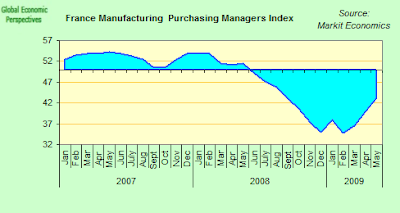 At 40.8 in May, the Global Manufacturing Input Prices Index posted its highest reading since October 2008 but remained below the neutral 50.0 mark for the eighth month running. Only India and Russia saw increases in costs. 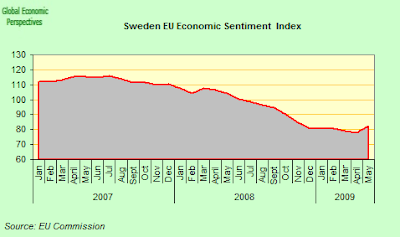 The rate of decline eased sharply in the U.S.
Sweden's seasonally adjusted purchasing managers' index rose to 43.7 in May, climbing for the fifth consecutive month, according to the reprot from the survey sponsors Silf and Swedbank. The May result compared with a 38.8 reading in April and was considerably above consensus expectations for a 40.2 result. 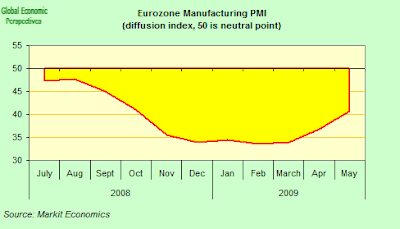 The Markit Eurozone Final Manufacturing PMI posted 40.7 in May, up from 36.8 in April and above the earlier flash reading of 40.5. The rise of 3.9 points in the PMI was the largest seen since the survey began in June 1997 and raised the index further above February’s record low to hit a seven-month high. However, the PMI extended its run below the no-change mark of 50.0 into a 12th successive month, a sequence unprecedented in the series history. National PMIs stayed firmly in recession territory across all of the member states covered by the survey. However, the indexes for Germany, Italy and Spain all rose by the largest amount in their respective series histories. Greece posted the highest reading overall. The rise in the PMI was driven by a record easing in the rate of contraction of manufacturing output, which fell at the weakest pace since last September and slower than indicated by the flash estimate. Rates of contraction eased most sharply in Germany, Italy and Greece (which also posted the slowest decline overall). The consumer, intermediate and investment goods sectors all saw rates of output contraction ease during the month. The rate of decline in new orders was the weakest since August 2008 and slower than the earlier flash estimate. All countries covered by the survey saw a shallower rate of retrenchment of new orders. Order flows to investment goods producers were especially weak, although the rate of decline in this sector was much slower than in recent months. Consumer goods was the only sector to report a faster rate of reduction in new work than one month ago. May data pointed to a 12th successive monthly decline in manufacturing employment. The rate of job cutting was much slower than in April, but slightly faster than the flash estimate. All of the countries covered by the survey reported marked reductions in employment, but only Austria saw staffing levels drop at a faster pace than in April. Intermediate and capital goods producers continued to report the greatest decreases in staffing levels. Export order volumes continued to fall in May, with producers of capital goods hit especially hard. However, the overall rate of decline eased to its slowest since last September and was less steep than that signaled by the flash estimate. Rates of decline eased across all of the member states covered by the survey, with the most noticeable slowdowns signaled for Germany, Greece and the Netherlands. Input costs fell for the seventh month running, albeit at the second slowest pace during that period and to a lesser extent than signaled by the flash estimate. Cost deflation eased in all of the nations covered. The sharpest decrease in costs was reported by France and the weakest by Greece. Although the rate of decline in average output prices eased to a four-month low, it remained severe and was slightly faster than the earlier flash estimate. Falling output prices were blamed on weak demand and strong competition. Of particular note, Germany reported a record drop in prices charged. May data pointed to survey record reductions in stocks of both raw materials and finished goods. Germany reported the greatest depletion in both cases, and the stock reduction was again most pronounced in the capital goods sector. Buying activity was cut back further, although the rate of decline in quantities of purchases eased for the third successive month. Looking ahead, the combination of record reductions in inventories and a slower rate of decline of new orders meant the orders-to-inventory ratio – which tends to lead the production cycle – rose to an 18-month high in May (and above that calculated based on flash estimates). 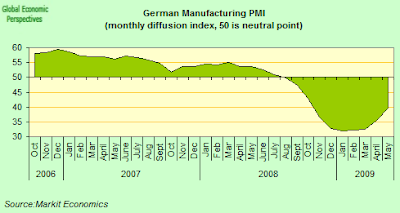 Germany's manufacturing PMI rose to 39.6 in May. That compared with 35.4 in April and was stronger than the 39.1 economists had expected. The improvement mainly reflected slower falls in output, new orders and employment than in April. 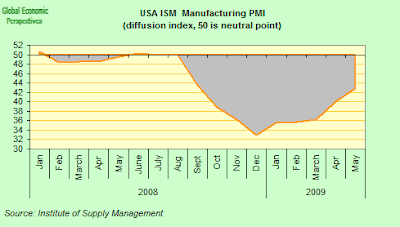 Although the PMI hit a seven-month high, the index was still well below the neutral 50.0 mark. Deteriorating operating conditions have now been recorded for 10 months running, the longest period since 2002-2003. May data signaled a sharp easing of the rate of decline in manufacturing output. Reduced rates of contraction have been recorded in each month since January’s survey record fall. Anecdotal evidence suggested that a more moderate drop in new orders supported production levels in May. The seasonally adjusted index measuring new order volumes recorded one of its largest ever one-month gains in May, to signal that new work contracted at a much slower rate than in April. Manufacturers noted that price discounting and improved sentiment about the economic outlook had supported client demand. New export orders also declined at a slower pace, with the rate of reduction the least marked since September 2008. A steep rate of job shedding persisted in May as firms continued to implement staff restructuring in response to excess capacity at their plants. Reports from panelists also pointed to a general aversion to hiring in May, leading to delays in the replacement of departing staff. Employment levels have now fallen for eight months running, but the rate of decline eased slightly since April’s survey record. Substantial destocking continued in May as firms adjusted to lower demand and sought to cut costs through improved stock management. Both stocks of purchases and finished goods inventories declined at their fastest rates since the survey began in April 1996. Average cost burdens dropped sharply in the latest survey period, albeit at the least marked rate since last November. This led to another marked drop in factory gate prices, with the rate of decline hitting a new survey record in May. France's headline manufacturing PMI climbed to a nine-month high of 43.3, from 40.1 in April. The PMI was boosted by slower falls in output, new orders, employment and stocks of purchases, while suppliers’ delivery times also exerted a weaker negative influence. Manufacturing production fell for a 12th successive month in May. Although still sharp, the rate of decline eased further from February’s series record and was the least marked since last August. The weaker drop in output mirrored a similar easing in the rate of contraction of new orders. The latest decline in new work was the slowest in 11 months, amid reports of a stabilization in demand following the severe weakening seen in the second half of 2008 as the financial crisis worsened. Data suggested that demand had firmed from both domestic and foreign clients, as the latest decrease in export orders was the smallest for eight months. In a further sign of recovering demand, manufacturers’ stocks of finished goods declined at the fastest pace in the survey history in May. It was the seventh fall in successive months, and suggests that the inventory cycle may soon reach a point at which production will need to be stepped up in order to rebuild depleted stocks. Reflecting the smaller fall in new orders, backlogs of work decreased at a weaker pace in May. The latest drop in outstanding business was the least marked in eight months. Employment also declined at a slower (albeit still marked) rate, with the pace of job shedding easing to a seven-month low. Firms’ purchasing activity contracted at a milder rate in May, mirroring the trend in output. That said, the decline in input buying was still substantial and contributed to another marked fall in stocks of purchases. A number of panelists linked lower preproduction inventories to efforts to improve cash flow. Lower demand for raw materials allowed suppliers to deliver purchased items faster on average in May. Consequently, lead times shortened for a ninth consecutive month. Weak demand also led a number of vendors to offer discounts and this, combined with lower prices for a number of commodities on global exchanges, resulted in a further steep reduction in average purchasing costs. Output prices decreased in May as manufacturers cut their tariffs in response to intensifying competition. The rate of decline remained sharp, despite easing to a four-month low. 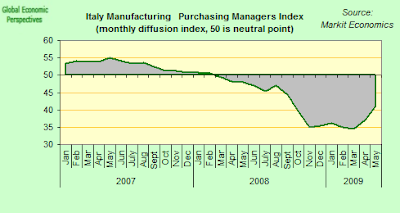 Operating conditions in the Italian manufacturing sector continued to deteriorate at a significant pace in May. Nonetheless, rates of decline registered for production, new orders and employment all eased, while stocks of postproduction goods fell for a second successive month. The headline Markit/ADACI manufacturing PMI rose from 37.2 in April to 41.1 in May. While this represented the greatest month-on-month gain in the history of the series, the index continued to register a considerable monthly deterioration of conditions and the level remained well below that recorded before the collapse of Lehman Brothers in September. Further falls in new business continued to suppress production volumes during May. Nonetheless, activity at manufacturing plants fell at the weakest pace since September 2008. Anecdotal evidence suggested that weak demand from both foreign and domestic clients (as a consequence of the poor economic climate) resulted in the latest decline in new order books. Even so, the deterioration of overall demand was the weakest in eight months. Italian manufacturers continued to trim staffing levels during the latest survey period. However, mirroring the trend in workloads, the rate of job shedding eased from April. Redundancies and the non-replacement of leavers were cited as methods of workforce streamlining. Destocking remained evident during the latest survey period. Post-production inventories fell for the second straight month during May, although the rate of decline was fractionally weaker than seen in the previous survey period. Average prices paid for inputs fell for the seventh month in a row during May. Nevertheless, the rate of decline was the weakest in the current period of falling costs. Survey respondents indicated that lower purchasing activity had intensified competitive pressures at suppliers – resulting in lower list prices. Firms also noted that the strong performance of the euro (notably against the U.S. dollar) had kept average costs down. Savings from lower input prices were swiftly passed on to clients in the form of lower factory gate prices during May. Panel members reported that the economic downturn had markedly increased competition, forcing manufacturers to reduce charges. Despite lower costs, marked falls in workloads resulted in a further drop in firms’ purchase volumes during May. Subsequently, suppliers’ delivery times shortened further and pre-production inventories fell at the fastest pace in the history of the survey. Germany's manufacturing PMI rose again in May, hitting 39.8. That compared with 34.6 in April. The improvement mainly reflected slower falls in output, new orders and employment than in April. 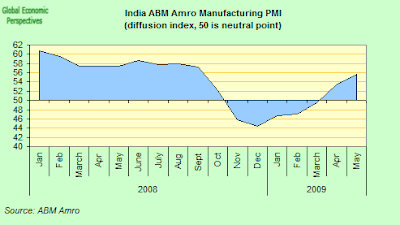 Although the PMI hit a nine-month high, the index was still well below the neutral 50.0 mark. Deteriorating operating conditions have now been recorded for 17 months running. May data signaled a sharp easing of the rate of decline in manufacturing output. Reduced rates of contraction have been recorded in each month since December’s survey record fall. The seasonally adjusted index measuring new order volumes recorded one of its largest ever one-month gains in May, to signal that new work contracted at a much slower rate than in April. The May manufacturing PMI eased back sharply, hitting the slowest contraction in seven months due to improvements in the generall outlook. 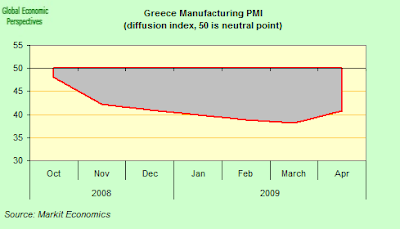 The Markit Greece Manufacturing PMI index showed that the rate of contraction in production, new orders and employment weakened. The headline PMI was the highest since last October, rising to 46.1, sharply up from the 40.9 registered in April. The decline in incoming new orders fell back slightly in May, and was the weakest recorded during the current recession. However, those surveyed reported that difficult operating conditions persist, due to the weakening in demand both domestically and in foreign markets. Employment, purchasing activity and stock levels all fell significantly, but at a slower rate than in April. 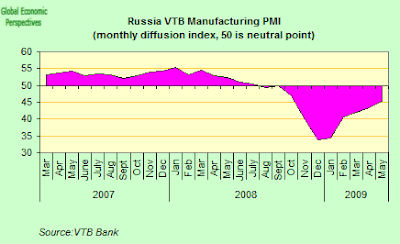 The May survey of Russian manufacturing business conditions from VTB Capital provided further evidence that the second quarter contraction will be much slower than the one registered in the first three months of 2009. The headline seasonally adjusted Russian Manufacturing PMI has been nudging up continuously from December’s record low of 33.8, and stood at a seven-month high of 45.3 in May. The month-on-month gains in the PMI over the past three months have averaged 1.6, following a record 6.2 rebound in February. Although the rate of decline in manufacturing slowed further in May, the sector is still experiencing a longer and more pronounced contraction than that seen during the financial crisis of 1998. 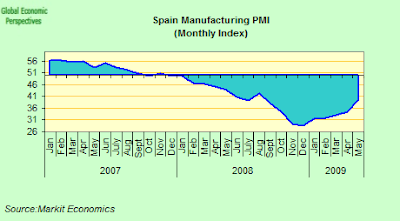 At that time the PMI was in negative territory for seven successive months in negative territory. The current run now extends to 10 months – and at a more substantial average pace of contraction. Underpinning the ongoing contraction in output was a sustained fall in incoming new work in May. Anecdotal evidence linked lower receipts of new business to a combination of subdued underlying demand and difficulties experienced by clients in securing sufficient credit. However, the rate of decline was the slowest in the current eight-month sequence. The pace of contraction in new export orders also slowed in May. Excess capacity in manufacturing remained in evidence in May, as outstanding business declined further. That said, the rate of reduction was the slowest since April 2008. The fall in manufacturing in two of the EU's largest East European economies slowed in May. Despite a certain stabilisation in credit markets and the appearance of some small 'green shoots', the EU's eastern front is still beset by a sharp industrial contraction, due to increasing export dependence accompanied by a collapse in euro zone demand. There is some evidence that improving sentiment in western Europe have produced slightly brighter expectations for industrial performance, particularly in Poland, where exports account for only about 45 percent of the economy, versus around 70 percent for the Czech Republic. 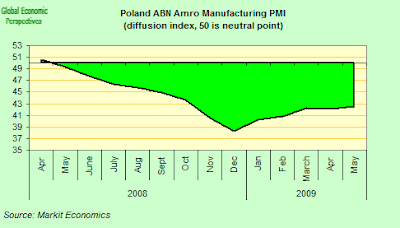 The Polish manufacturing PMI edged up to 42.55, from 42.1 in April, signalling the weakest pace of decline since October. 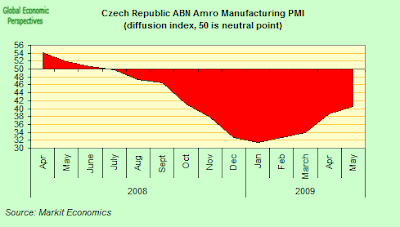 Czech PMI also crept upwards - to a seven-month high of 40.5, from 38.6 in April. The Czech manufacturing sector continues to experience a sharp contraction mid-way through Q2, although the worst of the industrial downturn may now passed. The PMI data also support the view that Poland is at this point weathering the crisis better than more export-reliant neighbours such like the Czech Republic. However, the worse-than-expected growth and industry data released last month, mean that these very slight upticks do not give much hope for a rapid, robust recovery, even in Poland which was one of the few countries to actually show year on year growth in the first quarter (0.8 percent) although the economy almost certainly contracted on a seasonally adjusted basis when compared with the last three months of 2008. Data released at the end of last week showed Czech industrial output fell by 23 percent in April, returning to a near record pace of decline after a brief respite in March. That followed a worse-than-expected year on year fall in gross domestic product of 3.4 percent in the first quarter. 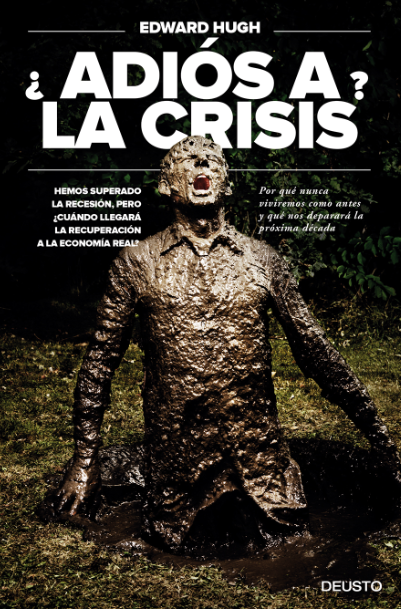 Economists have also warned that rising job cuts at firms, a contraction of investment, rising bankruptcies, and very weak credit growth were also taking a toll on the economy, preventing an early rebound from the crisis. Indeed Czech media reported only last Monday that truck maker Tatra will cut 450 of its 2,750 workerforce. Thus while expectations are improving significantly actual operating conditions are not. 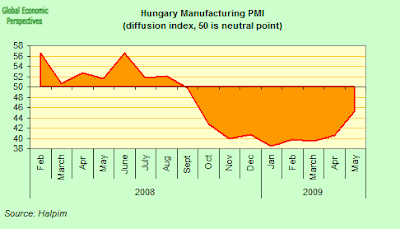 Hungarian manufacturing contracted for a record eighth consecutive month in May as the economic recession deepened. The manufacturing PMI came in at 45.3 in May - up from a revised 40.6 in April, according to Halpim - the Hungarian Association for Logistics, Purchasing and Inventory. This is the second month in which the contraction has eased. Hungary’s industrial production decline slowed in March, the latest month for which data is available, as the global economy showed signs of recovery, helping demand for exports. Output fell a workday-adjusted 19.6 percent from a year earlier after an annual 25.2 percent decrease in February. Turkish stocks hit an 8-month-high on Monday, rising along with other global bourses on encouraging data from China, and on the increasing evidence of green shoots at home. 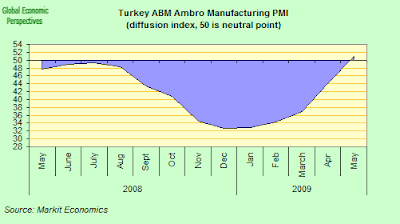 Turkey's manufacturing PMI rose in May to 51 from 44 in April, according to the Markit manufacturing PMI survey. A whisk above the 50 dividing line, but enough to put Turkey - along with India and China - in the very illustrious group of economies whose industrial sectors are now expanding. The recent improvement in Japan's industrial activity appears to have continued in May according to the latest reading from the Nomura PMI survey, since while the survey found that activity in the Japanese manufacturing sector fell for the fifteenth successive month, the drop in output was the smallest seen in just over a year. I wouldn't attach too much importance to the discrepancy between the PMI survey and the actual output outcome (production was up in April over may according to Minstry data) at this point, since the survey methodology (which is normally pretty reliable) is probably struggling a little to handle the severity of the shock in the manufacturing sector and calibrate results. The general direction of an easing in the annual rate of contraction is in harmony on both readouts. In fact, the seasonally adjusted headline Purchasing Managers’ Index (PMI) rose sharply in May to 46.6, from 41.4 in April, pointing to the slowest deterioration in operating conditions for nine months. May’s survey also showed that incoming new orders received by Japanese manufacturers fell for the fifteenth month running. But again the rate of decline continued to ease from December’s record drop to the smallest contraction in the weakest in the current sequence. While foreign order levels continued to fall, they did so at a much slower rate as improved orders from China continuing demand weakness in other regions (such as the US and Europe). May’s survey pointed to a sixth successive monthly decline in the prices charged by Japanese manufacturers for finished goods. Although still sharp, the latest drop in output charges was the weakest since last December. Strong competitive pressures and falling raw material prices were cited as key factors undermining manufacturers’ pricing power in May. Average cost burdens faced by Japanese manufacturers fell for the sixth month running in May. Despite remaining steep, the rate of decline eased to its weakest for four months. Lower raw material prices were reported to have depressed costs during the month, with steel frequently mentioned by panellists. Levels of business outstanding fell again in May, extending the current period of decline to sixteen consecutive months. Despite slowing to its weakest since last August, the rate of backlog clearance was still steep in the May survey period. Evidence provided by the survey panel linked the latest decline in work-in-hand to spare capacity resulting from falling workloads. 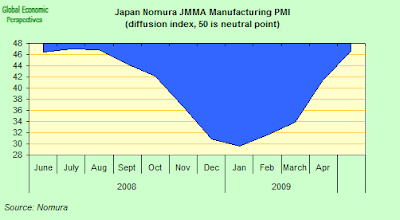 The PMI report also showed that Japanese manufacturers reduced their workforces for the tenth straight month in May. The rate of job shedding remained sharp, despite easing to its weakest for six months. Of those firms that reported a decline in employment, the majority attributed this to the non-renewal of temporary contracts and lower output requirements. 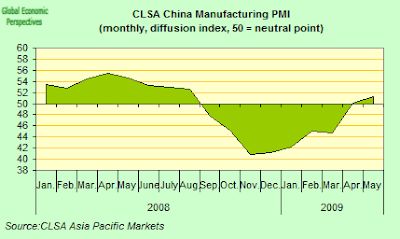 The CLSA China Purchasing Managers Index rose to 51.2 in May from 50.1 in April, making May the second consecutive month the CLSA PMI was above 50.0, after eight months of being below the critical line. The rate of destocking increased in May, which was encouraging given there is some anecdotal evidence that production may be running ahead of orders. On aggregate the reverse seems to be true. The CLSA China PMI is compiled by U.K.-based research firm Markit Economics. The export order index increased to 50.1, the first expansion in 11 months. The output index fell to 56.9 from 57.4 and the new order index dropped to 56.2 from 56.6. In fact in China there are two indexes, a fact which has lead to some controversy. The second index produced by the government-backed Federation of Logistics & Purchasing has repeatedly shown slightly higher readings, a feature which may be the result of giving a slightly larger weighting to the state enterprises, which are more oriented towards the domestic market. 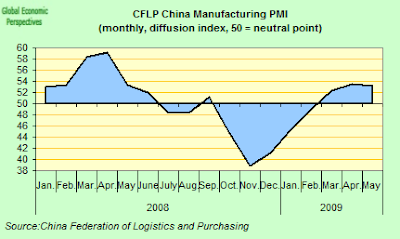 The May PMI saw the CFLP benchmark reading fall to 53.1 in May from 53.5 in April. This was the third consecutive month this index has held above 50. So despite a good deal of controversy about what exactly is happening in China, and how sustainable what is happening actually is, it does seem that, for whatever reason, manufacturing industry is expanding at this point. Conditions in India's manufacturing sector improved again in May, building on growth already seen in April. Most notably, the domestic market was the main driver of expansion, as foreign demand for Indian manufactures remained weak. A second straight month of output and new order growth led companies to hold off from further workforce rationalization. However, competitive pressures continued to restrain the pricing power of manufacturers. Despite accelerated input price inflation, firms cut their factory gate prices for the seventh month running. The headline Markit Purchasing Managers’ PMI rose for the fifth successive month in May (and for the second month of expansion) to 55.7. This was the highest reading since last September and indicated a marked improvement in the health of India’s manufacturing industry. With incoming new work and production rising since April, as well as an accumulation of backlogs, Indian manufacturers generally maintained their staffing numbers. Marginal growth in May ended a five-month period of retrenchment. "While employment and inventories continue to decline at a rapid rate and the sector continued to contract during the month, there are signs of improvement.....May is the first month of growth in the New Orders Index since November 2007, with nine of 18 industries reporting growth. New orders are considered a leading indicator, and the index has risen rapidly after bottoming at 23.1 percent in December 2008. Also, the Customers' Inventories Index remained below 50 percent for the second consecutive month, offering encouragement that supply chains are starting to free themselves of excess inventories as nine industries report their customers' inventories as 'too low'. The prices that manufacturers pay for raw materials and services continued to decline, but at a slower rate than in April." Latest survey findings indicated that Brazil’s manufacturing economy shrank yet again in May, with indices tracking trends in new orders, production, employment, backlogs and inventories still stuck in negative territory. However, data also showed that contractions in all of these variables, except finished goods stocks, slowed considerably. The monthly drop in output was especially small. 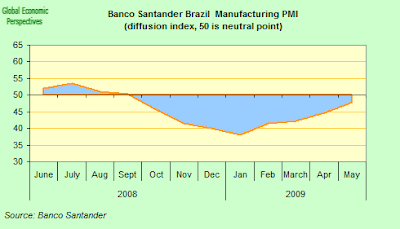 The seasonally adjusted Banco Santander PMI) climbed further in May to its highest level in the current eight-month period of contraction. At 47.8, up from 44.8 in the previous month, the index suggested a much more moderate deterioration in operating conditions. Again, data indicated that the improvement predominantly stemmed from the domestic market, as new export sales continued to fall steeply. Data for input costs, output prices and suppliers’ delivery times pointed toward a further steep drop in price pressures across Brazil’s manufacturing economy in May. Falling demand for raw materials left vendors with spare capacity. Consequently, lead times for input deliveries shortened for the seventh month running (although the improvement was restrained by poor domestic infrastructure). Competition among suppliers to secure new contracts provided manufacturers with greater scope for price negotiations. Alongside cheaper imports, resulting from a weakened U.S. dollar, pressure on vendors to reduce their prices contributed to another sharp decrease in average purchasing costs. Moreover, the rate of decline accelerated slightly to a new series record. Lower cost burdens were reflected in Brazilian manufacturers’ charges. Firms decreased their tariffs in order to attract more custom. This Is The Future, Now Lets See If It Works!